Saudi Arabia is waging unfair war on its neighbor, Yemen. They are bombing civilians, using weapons that the United States sold them. President Trump says he doesn’t want to stop selling them weapons because it will hurt the American people, he says our economy will suffer. The Yemen economy is shaken, people in Yemen are starving and dying because of the war. After reading more this morning on the situation in Yemen, I immediately wanted to express my disgust at the alliance between Crown Prince Mohammad bin Salman and President Donald Trump. Not only is their connection killing Yemenis, it led to the killing of the american journalist, Jamal Khashoggi. In my drawing, I tried to show an insensitivity and lack of moral compass in my depiction of Prince Mohammad bin Salman and President Trump. 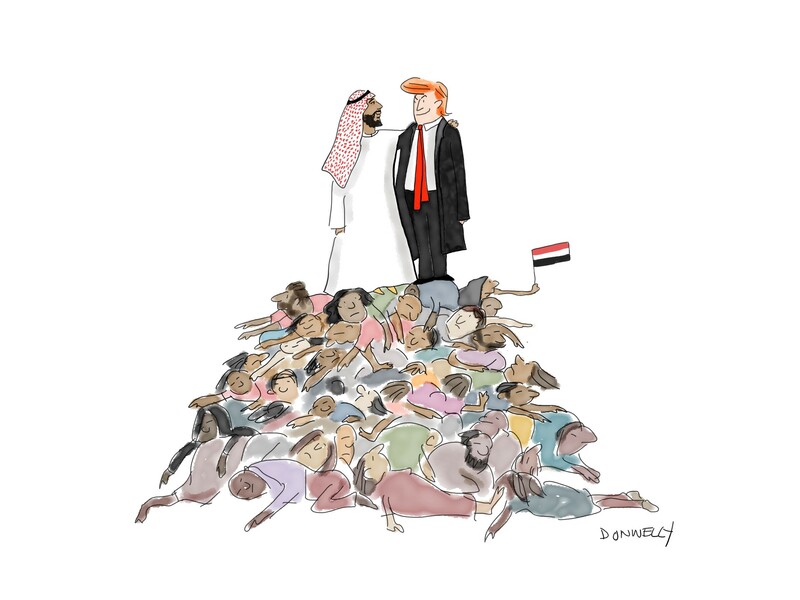 They are standing together in an embrace, smiling at one another, seemingly unaware that they are standing on the bodies of suffering and dead Yemeni citizens.